In a medium bowl, whisk eggs, sour cream, lemon zest, salt and pepper to taste until well combined. Set aside. Heat butter and oil in a 9-inch oven-proof pan over medium high heat until butter begins to bubble. Add onions and mushrooms and season with salt and pepper to taste. Cook for 3 minutes. Add the asparagus and season with more pepper. Cook until the onions are translucent and asparagus are cooked through yet crisp, approximately 3 minutes. Add the egg mixture to the hot pan and move the pan to the oven. 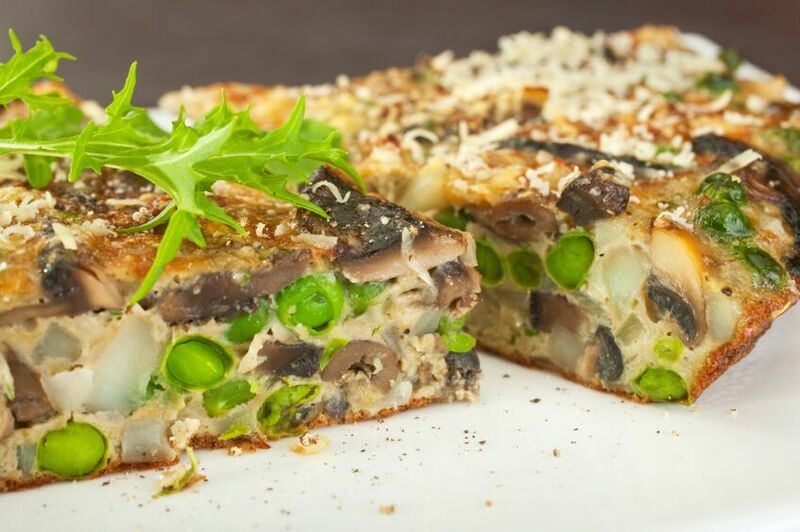 Bake frittata for 5 – 7 minutes or until all of the egg has set. Remove from oven and sprinkle with chopped chives and parsley. Allow to rest for 5 minutes until the egg has completely firmed up before serving. Serves 4.